BEACON community members during the "D.C. Founder Stories" panel, 2018 Circular Summit presented by Alice. 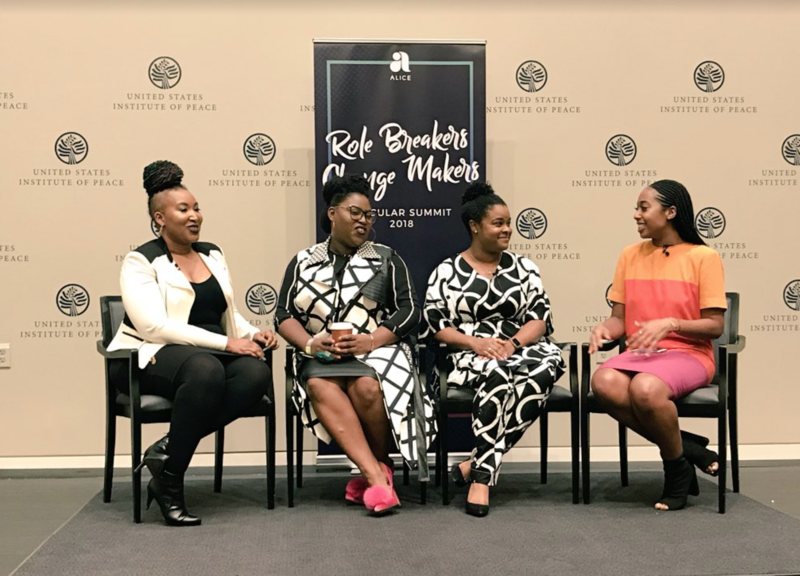 (Pictured Left to Right) Shelly Bell-Founder of Black Girl Ventures and BEACON Board Member, Takia Ross - Founder of Accessmatized, Shay Johnson - Co-Founder of MAGIC (Maximizing Achievement for Girls in Careers) and Deloris Wilson - Inclusive Innovation Fellow, BEACON. 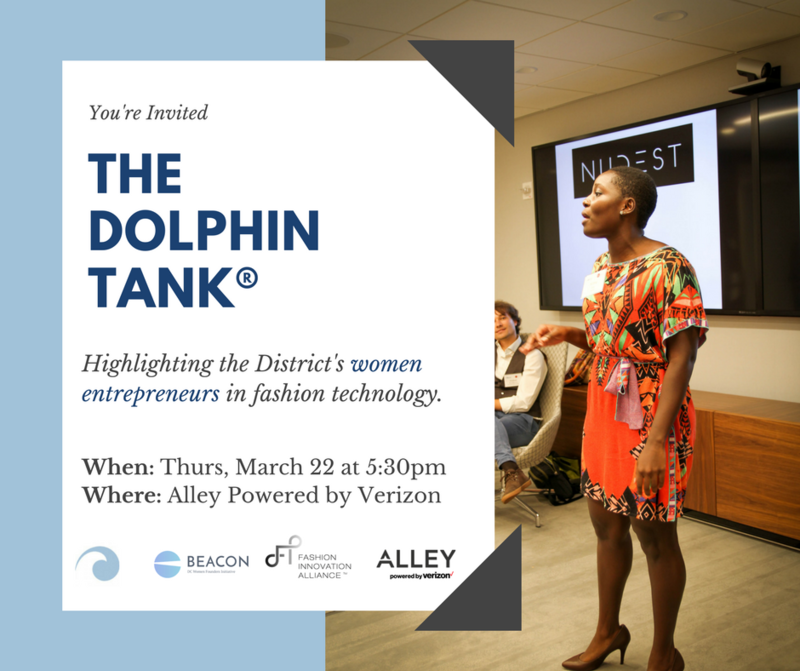 Attend an event that highlights women - such as Verizon's Conversation with Women Tech Leaders (3.14), the National Museum of Women in the Art's discussion on gender parity in museums (3.18), or Halcyon's Fast Forward series on the Future of Work (3.20). Nominate an amazing woman who codes, designs or works with data for the 2018 DC FemTech Awards. Take the Grubhub pledge to dine in or order delivery from women-led restaurants. Throughout the month of March, Grubhub will contribute $1 for every pledge (up to $1 million) toward community initiatives. The first $100k will go to the Women Chefs & Restaurateurs organization. Join the National Museum of Women in the Arts for a Wikipedia Edit-a-thon to help improve Wikipedia articles about women artists and encourage more women to become editors (3/17). Check out the various events hosted by the DC Public Library. Take a look at the Washingtonian's feature of five female chefs who are making their mark on the DC food scene. ...and more! We'll continue to share happenings from around the neighborhood throughout the month of March. Stay tuned! We're thrilled to have joined the 2018 Circular Summit powered by Alice. Over 300 women founders, investors, policymakers and more shared insights and inspirations with an international community of attendees. 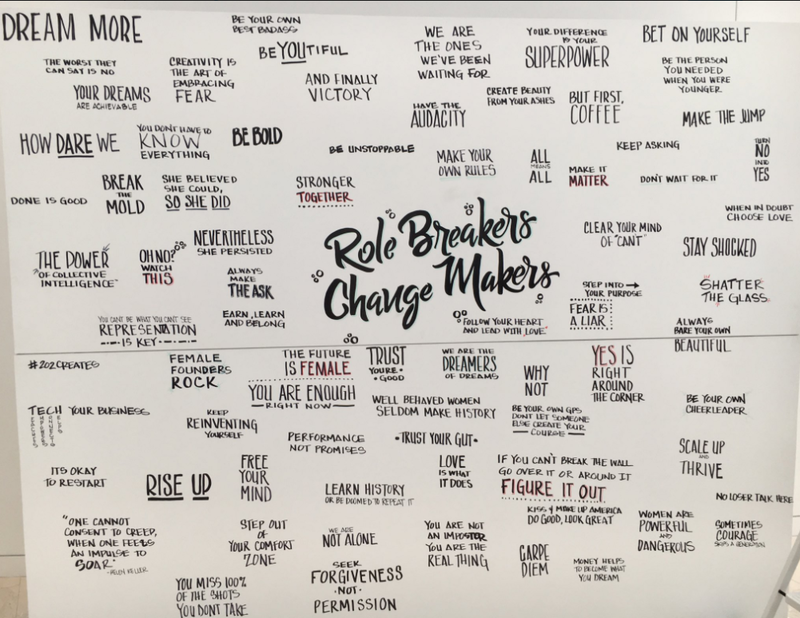 A number of BEACON community members were featured as speakers, panelists and attendees - including Ruth Chandler Cook of HireHer, Shelly Bell of Black Girl Ventures, Julia Westfall of Hera Hub and more! We're thrilled to welcome new founders to BEACON and are excited to keep the momentum going! 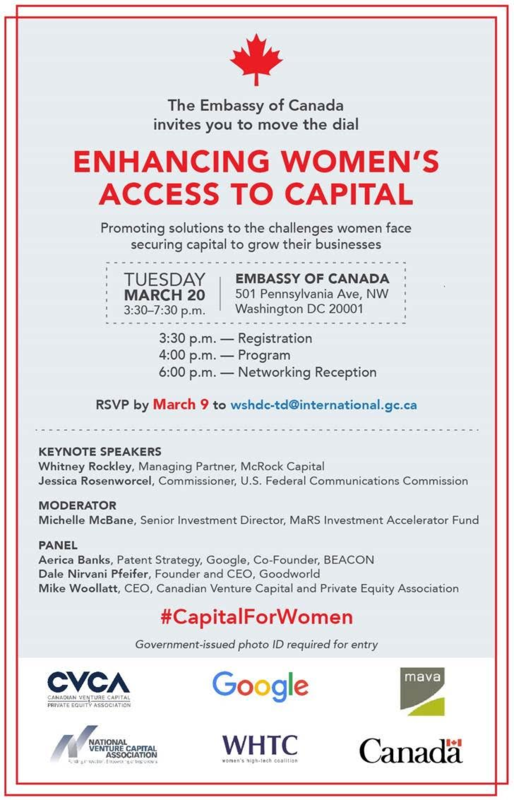 Amelia Friedman, Founder of Hatch Apps and Co-Founder of the Vinetta Project - D.C., was recently featured in Time Magazine in support of D.C.'s recognition as a top city for women in tech. With support from Halcyon, Y Combinator and a strong ecosystem in the District., Amelia raised a $1 million seed round for her app-building tech startup. Congrats, Amelia! Janice Omadeke, Founder and CEO of The Mentor Method and BEACON Grantee, was a featured speaker during the Kauffman Foundation's 9th Annual State of Entrepreneurship Address. Click here to hear her remarks. Thanks for working to empower women and minority-led companies Janice! Three BEACON community members teamed up to discuss "Food Freedom" and shared insights on our concept of wellness during an episode of Pineapple Radio. Check out what Samanta Attard of Happy Healthy Human and Lina Salazar of Live Well had to say! The Knight Foundation has an open call for ideas focused on "how might cultural institutions use technology to connect people to the arts?" Anyone can apply for a $50K grant to create a prototype of their idea of a thoughtful approach for using technology in the cultural sector. Learn more and apply by 3/6. Are you a woman of color founder + attending SXSW? 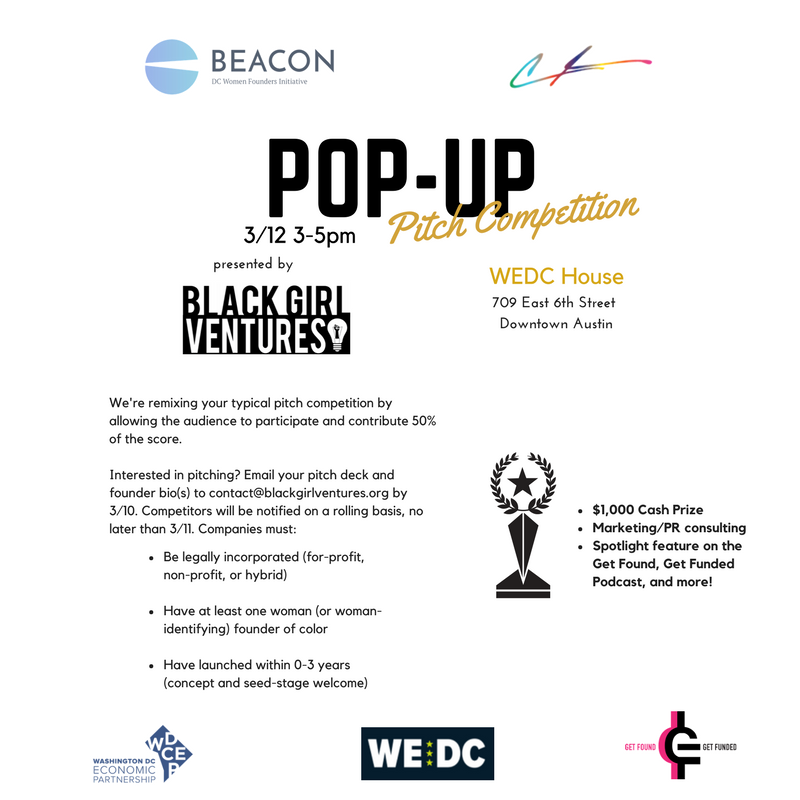 Apply to pitch at the "Pop-Up Pitch Competition" presented by Black Girl Ventures at the WeDC House. Click here to learn more. Apply by 3/10. 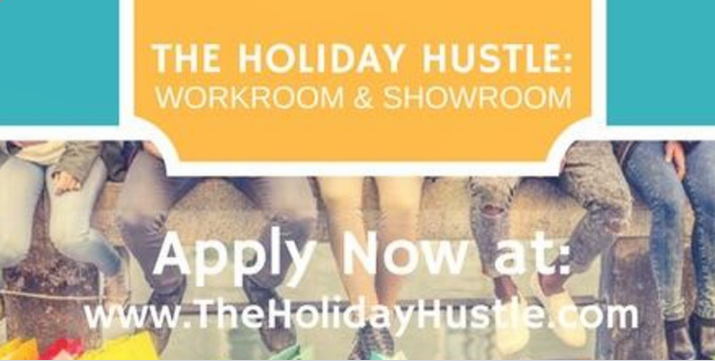 The Holiday Hustle: Workroom & Showroom is a four-day training and vending opportunity where entrepreneurs learn how to turn their passion into profit and interface directly with consumers during the Spring holiday season. As a BEACON grantee, the Holiday Hustle Program is powered by Global Empowerment Solutions in partnership with WACIF and the Minnesota Avenue Main Street program. Apply by 3/11. 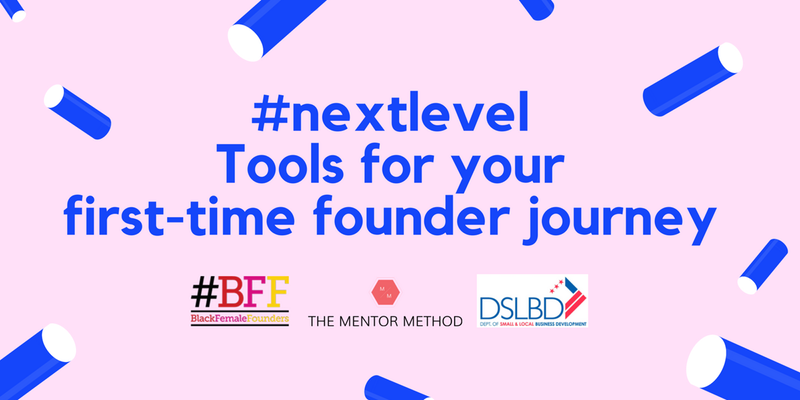 Applications are open for Black Female Founder's Pre-Accelerator Program! 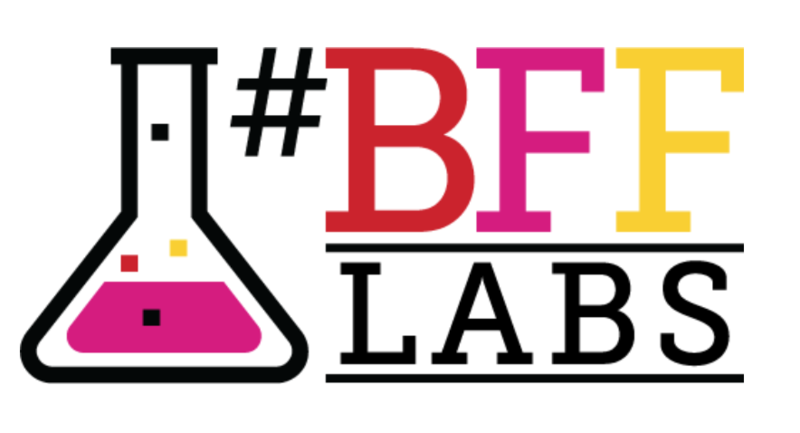 #BFF Labs is an eight-week program for aspiring early-stage entrepreneurs. 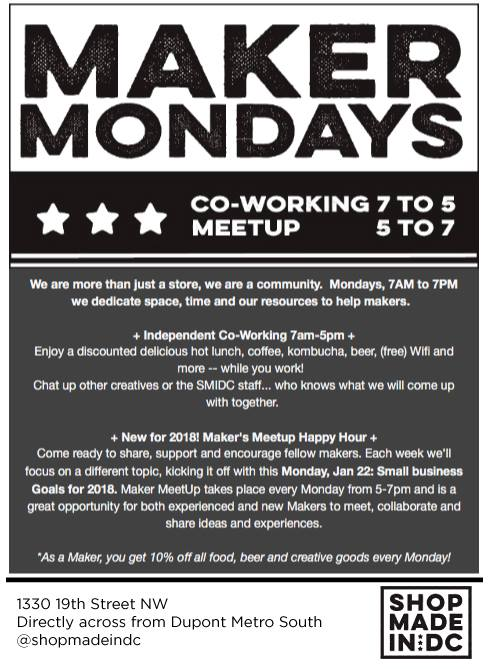 Every Saturday for 2.5 months (10am-4pm) in the DMV area, founders participate in immersive and interactive workshops led by subject-matter experts. Apply by 3/21. Calling all food entrepreneurs! Glen's Garden Market has launched AccelerateHERdc, a women-owned food business competition awarding a $10k investment, one year of strategic marketing and merchandising mentorship, free entry into the Good Food Awards, and more to a female food producer with retail-ready and sustainably-minded products from the Chesapeake Bay Watershed region (DC, MD, VA, WVA, NY, PA, DE). Apply by 3/31. Hillman Accelerator, which provides seed funding and support for early-stage startups with unique founding teams, will host office hours in D.C. on 3/23. Click here to request a meeting. 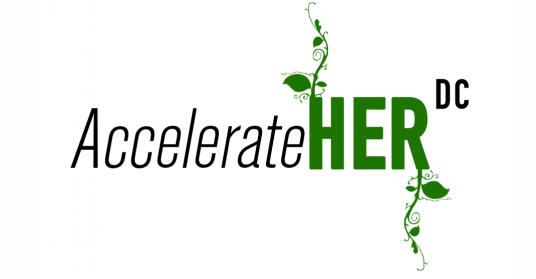 Halcyon Incubator is equipping early-stage social entrepreneurs with the support they need to transform audacious ideas into scalable and sustainable ventures. The application for the Fall 2018 Fellowship is now open. Learn more and apply before 5pm on 4/4. Halcyon Arts Lab seeks to support emerging artists who are interested in further developing a socially-engaged practice and creating connections and partnerships in Washington, DC. The nine-month fellowship includes housing, studio space and more. Apply by 4/4. The PROSPECTUS Online Business Accelerator Program uses original curriculum, a cohort model and a structured learning environment to aid multicultural women entrepreneurs and business owners in scaling and commercializing their entrepreneurial ventures. Enrollment closes 4/8. Are you or someone you know a filmmaker? Nominate a District of Columbia resident filmmaker to be considered for Filmmaker of the Month, an initiative of the Office of Cable Television, Film, Music and Entertainment. The 2018 DC FemTech Awards are accepting nominations! Do you know an amazing woman that should be recognized for her work in code, design or data in the DC region? Nominate her by 3/21! The EnrichHER Spark Conference is designed to help entrepreneurs with coaching, capital and connections. The May conference will feature an Entrepreneurship Showcase and is currently identifying multicultural speakers - click here to learn more and submit a nomination. Black Girl Ventures seeks a Community Manager (unpaid) focused on inclusive innovation and entrepreneurship. The position is open immediately for full-time (preferred) or part-time availability, and for a 3-6 month term. 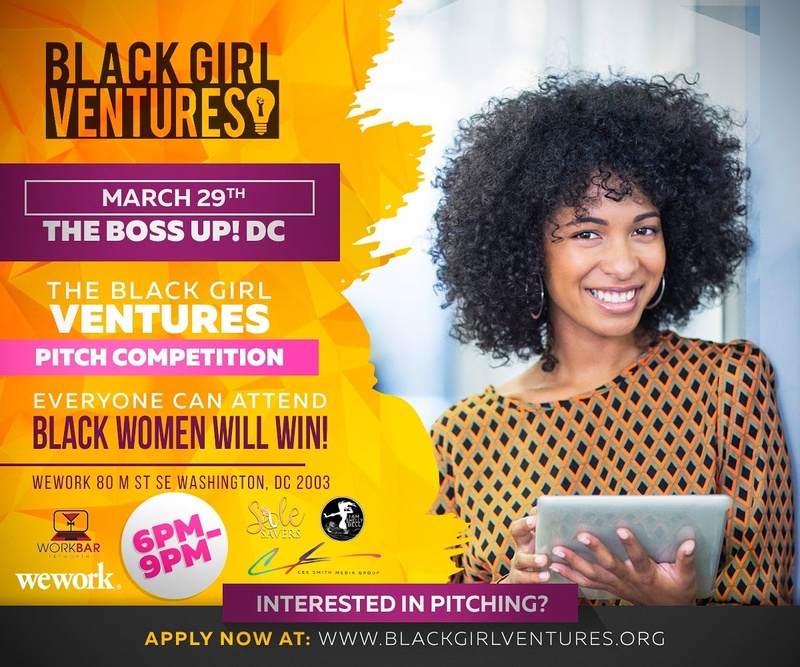 For more information including a full description and requirements, email shelly@blackgirlventures.org. Are you a digital artist interested in exhibiting your art in the "physical world," or throughout Washington, DC during a major international festival? In partnership with ARTECHOUSE, By the People invites you to submit your digital designs to take part in an augmented reality exhibition, 'art hunt.' Click here to learn more and submit your work. Were you affected by Impact Hub's closing? 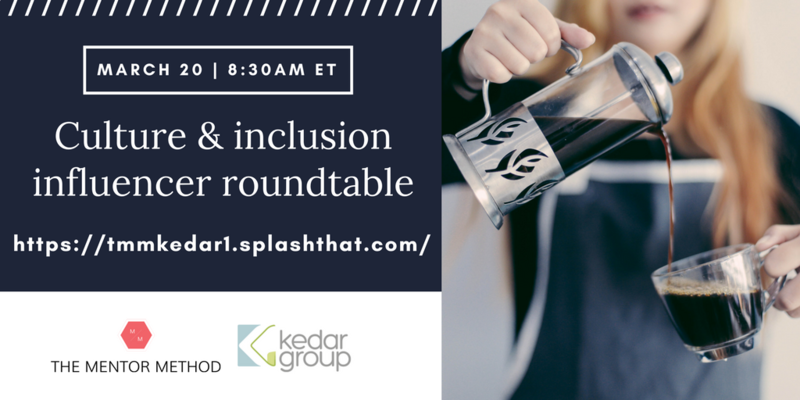 TheInclusive Innovation Incubator will honor your membership for a specified period of time. Contact aaron@in3dc.com for more info. 3.20: Ask the Experts! How to Market Your Business presented by the DC Department of Consumer & Regulatory Affairs in partnership with Social Driver, Brllnt, and more. At J2 Real Estate, we find homes, sell homse and make homes home. 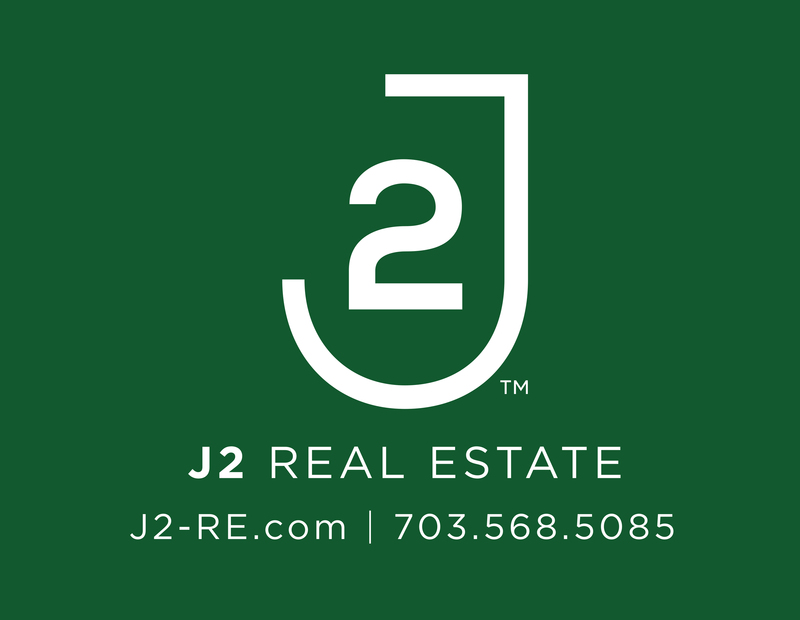 With decades of real estate experience in the DC metro area including over #350,000,000 in sales and over 1,000 homes marketed, sold or renovated, J2 Real Estate is your DC real estate one-stop-shop. Founder and President, Jonnie Jamison, has been actively involved in the Washington, DC real estate market since 2003. Click here to learn more about Jonnie and her company. The DC Small Business Help Workshop Calendar is a new monthly resource providing information about upcoming workshops and training opportunities available to startups, new and existing small businesses in the District. Check out the March line-up by visiting the link above and contact ebanfield@cnhed.org if interested in posting an upcoming workshop or training. Special thanks to the Coalition for Nonprofit Housing & Economic Development for producing this calendar!